Friends and family have shared their photos in our Flickr photo group Nelcie & Duls. This entry was posted on Thursday, September 25th, 2008 at 10:06 am	and is filed under photos. You can follow any responses to this entry through the RSS 2.0 feed. You can leave a response, or trackback from your own site. 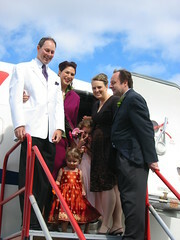 Nels and Dulcie were married August 30, 2008. Hugo was born September 28, 2009.